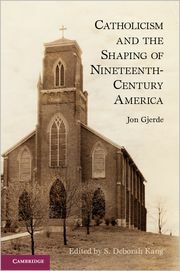 Another wonderful looking new book for today, this one by Jon Gjerde (Berkeley), Catholicism and the Shaping of Nineteenth-Century America (CUP 2012). The publisher’s description follows. Catholicism and the Shaping of Nineteenth-Century America offers a series of fresh perspectives on one of the most familiar themes – the nation’s encounter with Catholicism – in nineteenth-century American history. While religious and immigration historians have construed this history in univocal terms, Jon Gjerde bridges sectarian divides by presenting Protestants and Catholics in conversation with each other. In so doing, Gjerde reveals the ways in which America’s encounter with Catholicism was much more than a story about American nativism. Nineteenth-century religious debates raised questions about the fundamental underpinnings of the American state and society: the shape of the antebellum market economy, the transformation of gender roles in the American family, and the place of slavery in an ostensibly democratic polity were only a few of the issues engaged by Protestants and Catholics in a lively and enduring dialectic. While the question of the place of Catholics in America was left unresolved, the very debates surrounding this question generated multiple conceptions of American pluralism and American national identity.